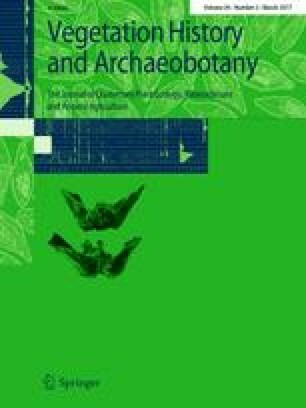 This paper describes the patterns and processes of vegetation change and fire history in the Late Holocene (c. 3,140 cal bp) palaeoecological sequence of El Tiemblo, in a mountainous area in central Spain (Gredos range, Spanish Central System), and provides the first Iberian pollen sequence undertaken within a Castanea sativa-dominated woodland. These new data reassess not only the autochthonous nature of the species in the region and in the Iberian Peninsula, but also the naturalness of well-developed sweet chestnut forests. The study focuses on anthropogenic dynamics linked both to the effects of livestock husbandry and the use of fire for forest clearance. With this aim, non-pollen palynomorphs (coprophilous fungi ascospores) and charcoal accumulation rate are useful indicators for assessing the increasing role of human influence on vegetation. We sincerely thank three anonymous reviewers and the editor for their constructive suggestions and comments. This work was funded by the project HAR2013-43701-P (Spanish Economy and Competitiveness Ministry) “Dinámicas socio-ecológicas, resiliencia y vulnerabilidad en un paisaje de montaña: el Sistema Central (9,000 cal bc-1850 cal ad) (DESIRÈ)”. J.A. López-Sáez is currently supported by a research Grant (Spanish Ministry of Education, Culture and Sport) at Caen Basse-Normandie University. We are grateful to A. López Andreu (RIP) and P. Sáez Navas for their collaboration and assistance during the field work.